, archbishop of Armagh in the fourteenth century, called sometimes Armaciianus, and sometimes Fitz Ralph, which was his family name, is supposed to have been born in Devonshire, or, according to Harris, at Dunda’k, in the county of Louth. 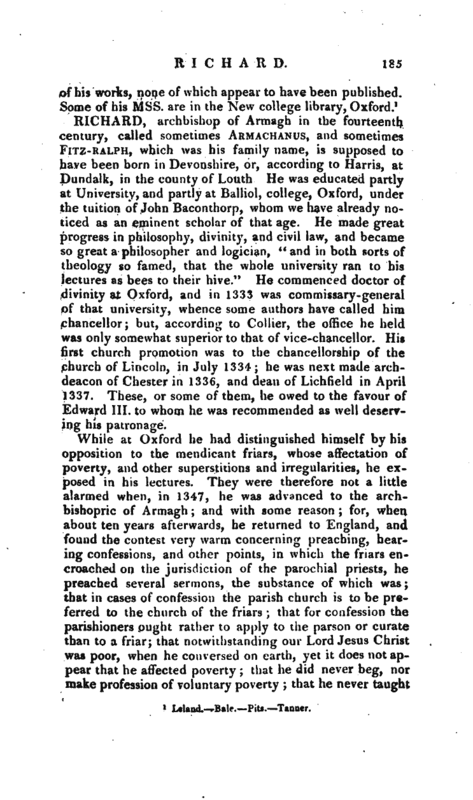 He was educated partly at University, and partly at Balliol, college, Oxford, under the tuition of John Baconthorp, whom we have already noticed as an eminent scholar of that age. He made great progress in philosophy, divinity, and civil law, and became so great a philosopher and logician, “and in both sorts of theology so famed, that the whole university ran to his lectures as bees to their hive.” He commenced doctor of divinity at Oxford, and in 1333 was commissary-general of that university, whence some authors have called him chancellor; but, according to Collier, the office he held was only somewhat superior to that of vice-chancellor. His first church promotion was to the chancellorship of the church of Lincoln, in July 1334; he was next made archdeacon of Chester in 1336, and dean of Lichfield in April 1337. These, or some f them, he owed to the favour of Edward III. to whom he was recommended as well deserving his patronage. While at Oxford he had distinguished himself by his opposition to the mendicant friars, whose affectation of poverty, and other superstitions and irregularities, he exposed in his lectures. They were therefore not a little alarmed when, in 1347, he was advanced to the archbishopric of Armagh; and with some reason; for, when about ten years afterwards, he returned to England, and found the contest very warm concerning preaching, hearing confessions, and other points, in which the friars encroached on the jurisdiction of the parochial priests, he preached several sermons, the substance of which was; that in cai>es of confession the parish church is to be preferred to the church of the friars; that for confession the parishioners ought rather to apply to the parson or curate than to a friar; that notwithstanding our Lord Jesus Christ was poor, when he conversed on earth, yet it does not appear that he affected poverty; that he did never beg, nor make profession of voluntary poverty; that he never taught | people to make a choice and profession of beggary; that on the contrary, he held that men ought not to beg by inclination, nor without being forced to it by necessity; that there is neither sense nor religion in vowing voluntary and perpetual beggary; that it is not agreeable to the rule of Observant or Friars Minorites, to be under engagements of voluntary poverty, &c. &c. The friars were so enraged at these propositions, which certainly shew considerable freedom of sentiment, that they procured him to be cited before pope Innocent VI. at Avignon, where he defended his opinions with great firmness, and maintained them, although with no little danger from the malice of his opponents, to the end of his life. The age, honwer, was not prepared to listen to him, and the pope decided in favour of the friars. He died Nov. 16, 1360, at Avignon, not without suspicion of poison. Fox says that a certain cardinal, hearing of his death, declared openly, that a mighty pillar of Christ’s church was fallen. He was unquestionably a man. of great talents and sound judgment. Perhaps his best panegyric is his being ranked, by some catholic writers, among heretics. 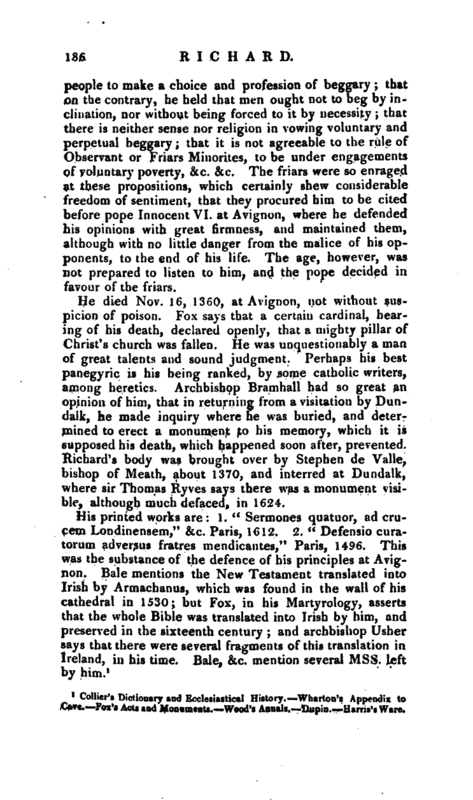 Archbishop Bramhall had so great an opinion of him, that in returning from a visitation by Dundalk, he made inquiry where he was buried, and determined to erect a monument to his memory, which it is supposed his death, which happened soon after, prevented. Richard’s body was brought over by Stephen de Valle, bishop of Meath, about 1370, and interred at Dundalk, where sir Thomas Ryves says there was a monument visible, although much defaced, in 1624. 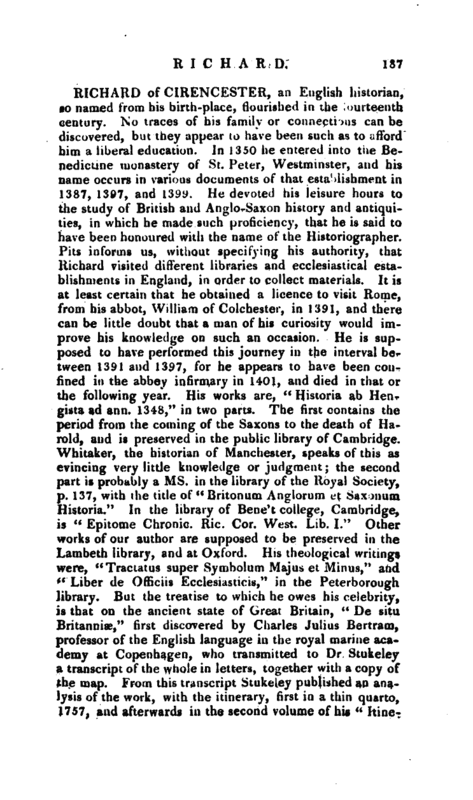 1 Collier’s Dictionary and Ecclesiaslical‘-History. Wharton’s Appendix to Cave. Fox’s Acts aad.Monumeuts. Weod’g Annals. D-.ipin. -Harris’s Ware.